Diphtheria Is Rare These Days — But Not In The Rohingya Refugee Camps In Bangladesh : Goats and Soda Diphtheria is not seen in the West because almost everyone is vaccinated against it. But it's been infecting thousands of the refugees in Bangladesh. Patients are treated at the Samaritan's Purse diphtheria clinic in the Balukhali Rohingya refugee camp in Chittagong district, Bangladesh. 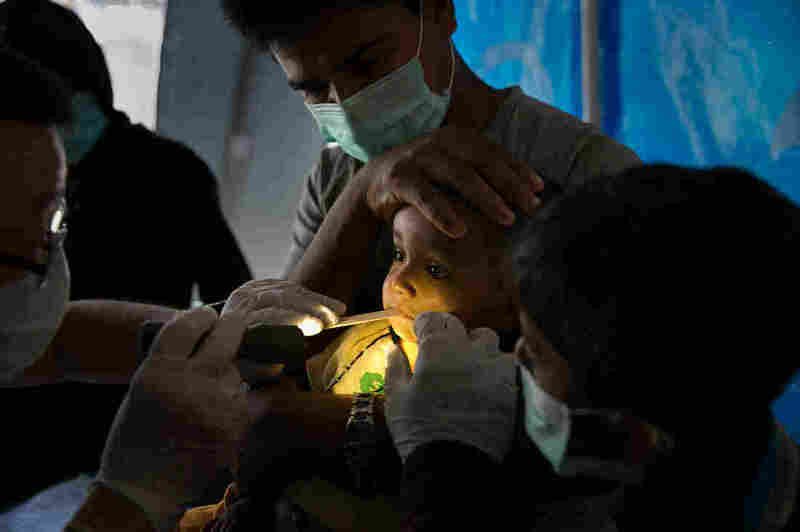 Diphtheria poses one more threat to already beleaguered Rohingya refugees. The outbreak started in the sprawling camps in Bangladesh in November soon after hundreds of thousands of Rohingya arrived. It appeared to have peaked around New Year's but now there is renewed concern as the potentially fatal disease continues to spread. 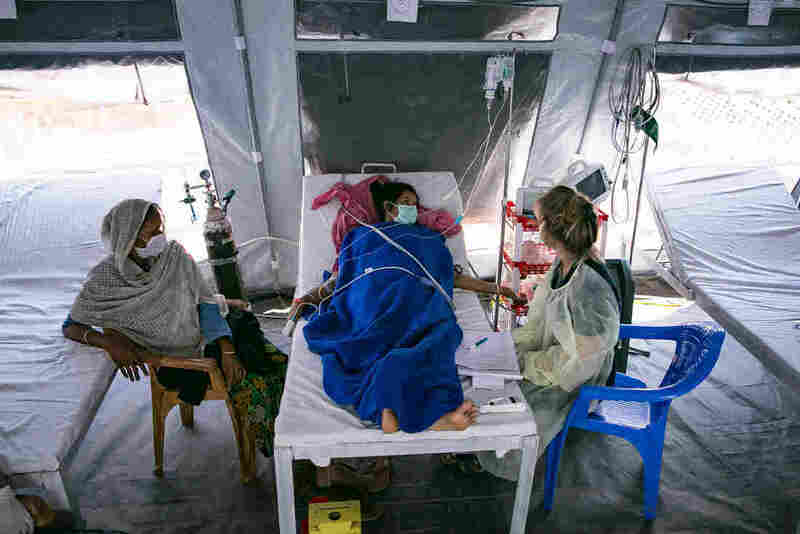 "Yesterday was a very busy day for us," Dr. Andy Doyle said earlier this week at the Samaritan's Purse diphtheria treatment center in the Balukhali refugee camp. "We saw 117 patients come in to be screened [for diphtheria]. That's the most we've seen in any given day." 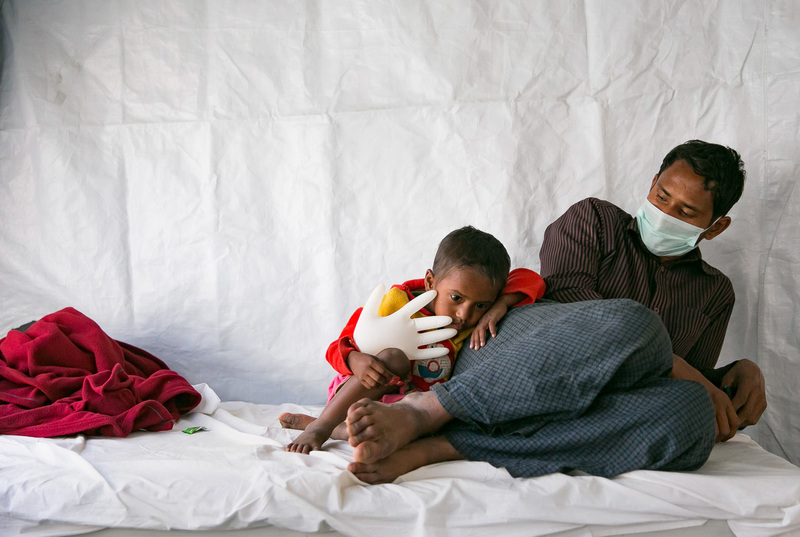 By mid-January, there had been nearly 5,000 reported cases of diphtheria in the camps and 33 deaths. Doyle is the medical director of the tented field hospital. The waiting area, which is just some benches under a tarp roof, is jammed with people waiting to be checked for diphtheria. Doyle says it looks as if they could have a record number of patients for a second day in a row. Doyle and his team only treat diphtheria at this facility. So the very first thing the staff members do is screen the patient for the disease and make sure it's not just a bad cold. "[Diphtheria] is not something we see in the West," Doyle says of the airborne bacterial infection. "Most of us from the West that are working here never saw this disease until we got here a week or two ago. And now we're experts on it." Diphtheria isn't seen in the West because almost everyone is vaccinated against it. Doyle says the disease turns out to be pretty easy to identify. The patients have high fever, a sore throat, often a runny nose and severe inflammation in the back of their throat. "Sometimes they get swelling in their necks, especially in the younger children, and their neck itself will get really big," he says. "It's called bull neck. And those are the signs that the airway is in impending danger. So that's what we look for." That's how diphtheria kills: The neck swells up and a membrane develops in the throat that blocks breathing. As of the middle of January there'd been nearly 5,000 reported cases of diphtheria in the camps and 33 deaths. This is a far lower fatality rate than in past diphtheria outbreaks. That's probably because patients get access to health care quickly in the half a dozen clinics that have sprung up in the camps. Simple cases of diphtheria can be treated with antibiotics. But if the airway is in danger of being blocked, an anti-toxin is administered via an intravenous drip to wipe out a poison that the bacteria makes. But the anti-toxin has the potential to spark a fatal reaction. 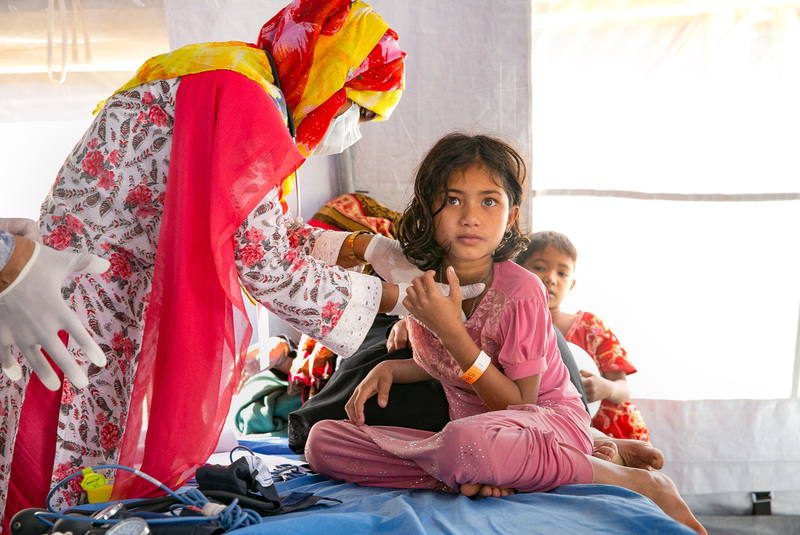 In a ward in a white tent behind the reception area, Nur Aysia Begum is on hour two of what could be a six-hour treatment with the anti-toxin. She's one of the more than 650,000 Rohingya refugees who arrived in this camp five months ago to escape what the U.N. has called a campaign of ethnic cleansing by the Myanmar military. Her mother, Nayna Khatun, who's sitting by her side, says they feared they'd be killed by the soldiers if they stayed. Now her family depends on international food aid to survive. When her daughter got sick, Khatun was worried because she didn't have any money to pay for a doctor or medicine. All of the treatment at this clinic is free. Doyle says administering the anti-toxin is difficult and time-consuming. "That nurse," he says pointing to the nurse at Begum's bedside, "will sit at that bedside watching for the slightest hint that an allergic reaction is about to start." Public health officials are very concerned how vulnerable the hundreds of thousands of Rohingya refugees are to diphtheria and other infectious diseases. The refugees are packed together in makeshift shelters. Toilets and water wells have been randomly dug all over the camps, often side by side. 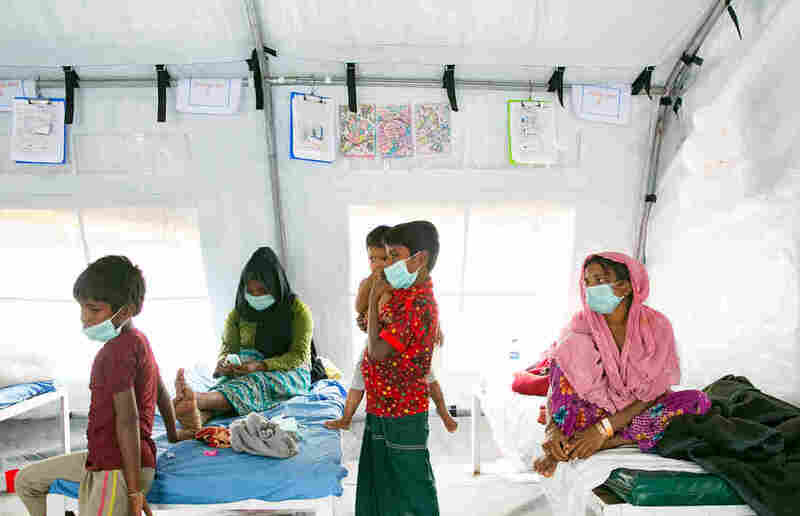 Marcella Kraay, a project coordinator with Doctors Without Borders, says another key factor putting the Rohingya at risk is that back in Myanmar they lacked access to even the most basic immunizations. "We've had a big measles outbreak and we've also had the biggest diphtheria outbreak that the world has seen in a long time," she says. Health care isn't the only thing the long-persecuted Rohingya lacked in Myanmar. Myanmar doesn't consider the Rohingya to be citizens. The Muslim minority have faced discrimination in schools and the workforce. They need permission from the government to leave their villages. Some were forced to live in camps. And this was all before the military started attacking them and burning their villages to the ground last year. Myanmar denies harassing the Rohingya. Myanmar officials say the military was conducting a cleanup operation against terrorists at the time that hundreds of thousands of Rohingya fled across the border in to Bangladesh. 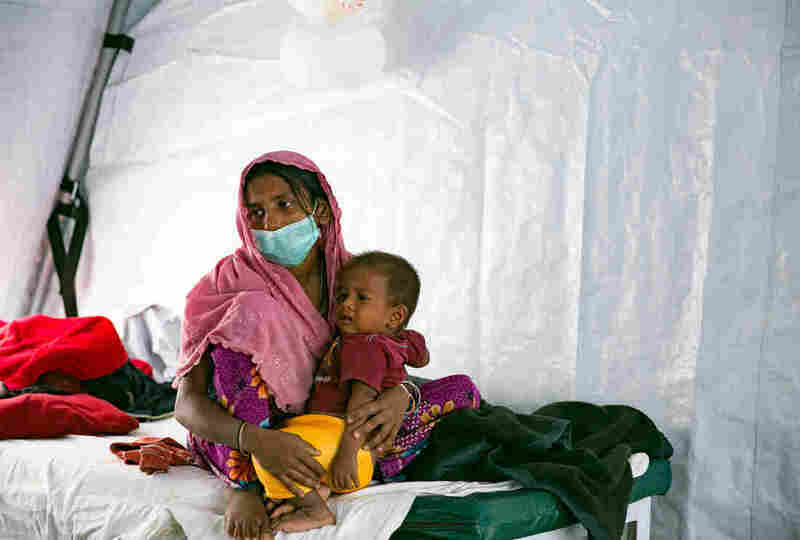 Kraay with Doctors Without Borders says the Rohingya had very little access to health care. Some had never been to a clinic or seen a doctor. Humanitarian groups have launched a massive campaign to try to counter that long history of medical neglect. Health workers from international nonprofits and the Bangladesh ministry of health are trying to immunize nearly a million people in and around the refugee camps against diphtheria and other vaccine-preventable diseases. The diphtheria vaccine, however, is a difficult one to administer. It requires three shots spaced usually several months apart. Health officials here did a first round of diphtheria vaccinations at the end of December and hope to cram in the final two rounds in the coming weeks. Until then diphtheria has hundreds of thousands of susceptible targets in the camps.